stylos: Translation Note: Hebrews 10:23: profession of our hope or profession of our faith? Translation Note: Hebrews 10:23: profession of our hope or profession of our faith? Last Sunday morning I preached on Hebrews 10:11-25 at CRBC. A point of text/translation arose with v. 23. The question: Should Hebrews 10:23 read “profession of our faith” or “profession of our hope”? In this case there is little controversy with the Greek text. Both the TR and the modern critical text read: katechomen ten homologion tes elpidos akline [let us hold fast the confession of (our) faith without wavering]. The key point is that both include the noun elpis [hope] rather than pistis [faith]. The apparatus to the modern critical text does not show any textual variation at this point. The Greek mss. read elpis. One variation of note, however, is the fact that the pronoun “our” [hemon] is included in the original hand of Sinaiticus, the Old Latin, and Syriac Peshitta. Modern translations, including the NKJV, uniformly read hope rather than faith (cf. RSV, NASB, NIV, NKJV, NRSV, ESV, etc.). 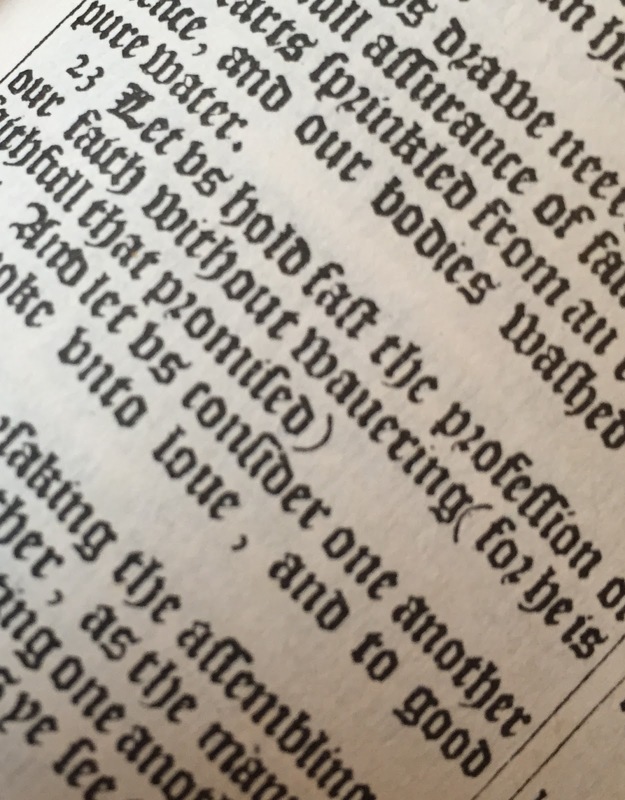 As noted, though the 1611 edition of the KJV reads faith rather than hope, some later editions of the KJV read hope. 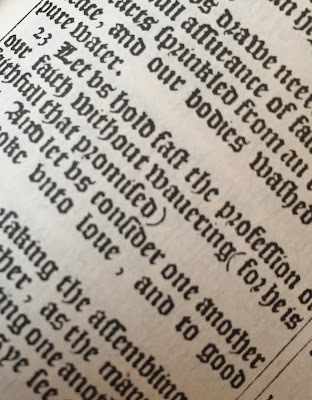 The Cambridge Paragraph Bible of 1873 (Hendricksen, 2009) edited by F. H. A. Scrivener, reads “hope” rather than “faith.” My guess is that the editor sought to conform this edition to what he perceived was a more literal approximation of the Greek original (elpis). Why does the KJV read “faith”? There are, I believe, two possibilities for the KJV rendering. One is that the KJV translators had access to an early mss. which read “faith” [pistis] rather than “hope” [elpis], which they privileged. More likely, this is probably an example of the KJV translators’ commitment to variation in English renderings of the underlying original language words. As the translators tell the reader in the preface: “we have not tied ourselves to an uniformity of phrasing, or to an identity of words, as some peradventure would wish that we had done” (see “The Translators to the Reader”). In this case, the translators rendered elpis as “faith” rather than its more typical translation as “hope.” As with the KJV’s rendering of Paul’s stock phrase me genoito as “God forbid” the KJV translators here make a rare preference for a more dynamic than formal rendering. Perhaps this was to give emphasis to the noun homologia, confession or profession, with the translators conveying that the essential meaning of a “profession of hope” would be a “profession of faith.” We must also keep in mind that the great “faith” chapter (Hebrews 11) follows this passage. Is this rendering legitimate? In his commentary on the verse, John Owen observes: “Wherefore holding fast our hope, includes in it the holding fast of our faith, as the cause is in the effect, and the building in the foundation” (Hebrews, Vol. 6, p. 515). Owen proceeds to make clear his preference for the translation “profession of faith” noting it “is more suited to unto the design of the apostle, and his following discourse” (Ibid). When I preached on Sunday, I felt comfortable using the KJV rendering without making reference to variations in translation.